Filings and formal listings can occasionally be a means to see a product before it's revealed to the world, and we may just have such a case today. 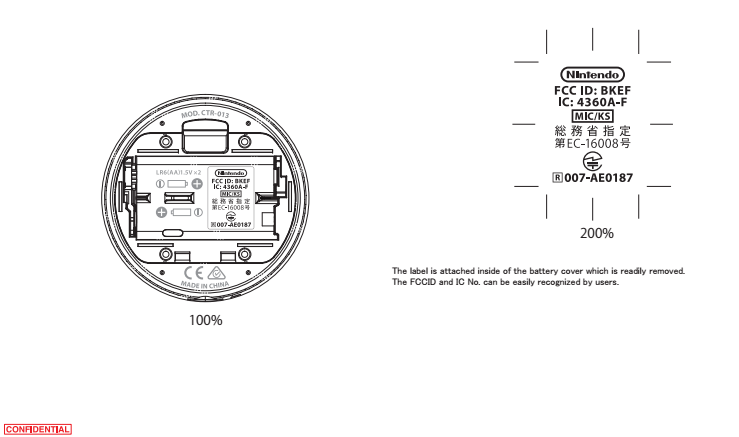 Eagle-eyed observers on NeoGAF have unearthed an approved FCC listing for a Bluetooth device that looks very much like the amiibo NFC Reader, but in this case with potential support beyond the 3DS. So, what's been found on a factual level? It's an FCC (US-based Federal Communications Commission) approval for a Bluetooth device, with a limited number of documents available to see. A number of documents and reports for the record, such as photos and schematics, are currently marked as confidential until 18th April 2017, with some documents available from today (19th October). Only one image has made it through so far (which was evidently confidential in earlier stages of the application), with the model number (CTR-013) being one above the reference for the 3DS NFC Reader (CTR-012); the latter was released to allow amiibo figures and cards to be scanned and used fully with original 3DS models, which lack the in-built NFC reader of the New Nintendo 3DS. The 3DS NFC Reader utilises IR (Infrared), but a potential Bluetooth device could enable amiibo to utilise the Bluetooth capabilities of smart devices. Though most smart devices support NFC, some examples such as iPhones lock the technology behind specific features and functionality, such as Apple Pay. It's possible that this device is also a way for Nintendo to control how amiibo would read and write data on a phone or compatible tablet, providing a layer of security. Whatever the reasoning, it's possible that Nintendo could utilise such a reader to support amiibo on a variety of smart devices. With Nintendo bringing more and more major IPs to mobile - including some that have supported amiibo on 3DS and Wii U - this could be a smart move. Naturally some will wonder whether this listing could also relate to a peripheral for the mysterious NX, though we're not sure about that. We'd be surprised if Nintendo's next system doesn't support amiibo within the hardware (in the same way as the Wii U GamePad and New 3DS) but at this stage that's simply unknown. In any case, this seems to be a Bluetooth NFC Reader, which could mean interesting times ahead for amiibo. Let us know what you think in the comments. Sounds pretty cool, and would definitely be useful for, say, an Amiibo app. The idea of using your amiibo on either your NX, your 3DS and your smart devices seems like a big opportunity for Nintendo to use Amiibos as the link between these products. You could even swap data between games on the NX and on smartphones to unlock things or progress further in a game. This could encourage non-gamers to buy the NX if they look at Nintendo's smartphone games and see that they can do 'more' with it by buying specific amiibo or software for the NX. I also wonder if Nintendo can put the built-in NFC technology in smartphones to use with amiibo. I saw some time ago a video where someone opened an emulator running Xenoblade Chronicle on his phone, using a Shulk Amiibo. Maybe Nintendo can make a free game where you can unlock certain minigames using Amiibo? NX launch date 18th April 2017 confirmed! Be a bit backwards if NX can't scan amiibo out of the box. Still, positive news that they have future plans for amiibo at least. Maybe it's just their updated fit meter, so it can track your steps and workout progress while you wear it. Amiibo and smartphone games have been Nintendo's biggest commercial breakthrough successes of late. This would make allot of sense really. It would make no sense for NX to not have amiibo support. One would hope they add an 8-bit skin to Mario Run and then let you scan in Amiibo to play as different characters. They could just recycle the Mario Maker sprites. As for the phone thing, that would be a cool thing to see and would probably sell even more amiibos! Hopefully it gets announced that games like Super Mario Run will use it. @Captain_Gonru One way or another. Oh, if you aren't in the mood to click thru, its an amiibo bluetooth reader patent for Ntinedo. Like the 3DS portal, but w bluetooth instead of IR. Wouldn't surprise me if NX was compatible with amiibo. They'd be dumb not to with the rumored Smash NX port and Zelda: Breath of the Wild having amiibo support on the Wii U. However, amiibo aren't what makes Nintendo tick (well, they did for the past couple years), but a lack of interesting amiibo and really amiibo in general over the past year leads me to believe that they'll be phased out and gone by 2018, 2019 at the latest. @premko1 They're a scam and contribute nothing to gaming. Eh ? Is that exact date for NX launching date ? Or is that your prediction ? "Though most smart devices support Bluetooth, some examples such as iPhones lock the technology behind specific features and functionality, such as Apple Pay." @SLIGEACH_EIRE I agree that they don't contribute anything to gaming (in fact they lock content behind $15 pay walls) but they're nice collectibles nonetheless. @rjejr You might want to pay attention to the news tomorrow. Well...amiibo card for ACNL new update contribute hugely and very useful to get Dreamy Villagers. It still useful. And at least you can still treat them as a Figurine if not being used for playing. @IceClimbers Oh I'll be watching. Hopefully something more than Reggie and Bill joking around and telling us when the reveal date is. @Captain_Gonru Those new Skylanders are ugly, and the totem key things are too expensive at $9.99. 4 games was already 1 too many. And last year turned people off, maybe no going back. Lego D has no new game, whoever decided on the new Ghostbuster movie as a $49.99 story pack has probably already been fired. I think it will pick up a little bit w/ Sonic, ET, Goonies, Gremlins and Fantasitcial Creatures, but nobody cares about Tom Cruise. And too much Adventure Time. We bought Mr. T for 4 player, but new DLC toys are not as exciting as a new game. amiibo I just don't know about. What will NX bring? Those MHS amiibo are awesome, and the new Zelda ones as well. Since so many people already own so many a new game could work. MMO would be a big change for Ntnedo. Would breath new life into the amiibo's, so sure. Well, NX seems like a natural assumption, especially if backwards compatibility proves to be involved. Smart devices? Not surprising either, seeing as Big N is coming to that market. No, I'm not watching it, the ads we keep seeing are a horrible mess, even worse than last year. And watching Arrow I'm remembering why I didn't want to watch Arrow anymore b/c of that whole nuked city episode. But the Russian segments are good. And after this season, well that's his 5 years on/off the island, so I can be done then. So anything you learn in Legends feel free to pas along. I have my wife Googling it now though.